The cleaning begins with thorough hoovering and examination of your sofa and upholstered furniture. Our professional cleaners will clean your couch, settee, convertible sofa, divan, loveseat, sectional sofa, hide-a-bed, sofa bed and more. 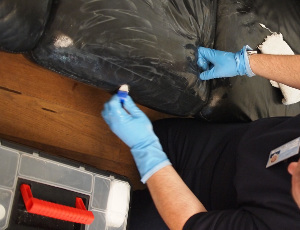 We are prepared to remove a wide variety of stains from your sofa and furniture. The cleaner pre-treats all stains and dirt patches with the appropriate detergents. We deal with wine, blood, paint, coffee, tea, rust, oily and vomit stains. The cleaner will use either steam or dry cleaning method. Upon request, we can deodorise your sofa to remove any bad odours. We provide also additional upholstery stain protection. Our sofa and upholstery cleaners are trained in cleaning different types of upholstery such as silk, wool, cotton, suede, viscose, leather, plush, acrylic and linen. For leather sofa cleaning, the cleaner uses a special foam, and after that a leather rejuvenator to condition the leather. It will keep it moisturised and protected from cracking and flaking. Dry cleaning is used for furniture and sofas upholstered with velvet, suede and other delicate materials. Excellent Carpet Cleaning was founded more than ten years ago in Lewisham SE. Since that time it has grown into one of the most liked and top preferred companies for commercial and domestic upholstery cleaning in the region. We can deep clean all types of upholstered furniture and sofas. You can rely on us to clean your couch or settee, traditional sofa, convertible sofa, loveseat, settee, divan, sectional sofa bed, hide-a-bed, couch bed or sleeper sofa. In addition to our sofa cleaning, we deliver the following professional services: drapery cleaning, curtain cleaning, mattress cleaning, bed bug treatment and blinds cleaning. The mattress cleaning service can help minimise the symptoms of dust allergies, asthma, runny nose, headaches and itchy red eyes. Our cleaners don't use moisture to deep clean your mattresses and pillows from debris and dust. They use a high intensity ultra-violet light to successfully remove fungal spores, bacteria and dust mites. Ordering our professional deep upholstery and sofa cleaning needs no deposits, and only few minutes of your time. Call 020 3404 0500 or use the online contact form. You can book our cleaning service for any day of the week. We can provide same day cleaning services as well. We have fixed prices and no hidden charges. We give our regular customers, local agencies and landlords preferential prices. For the best deals, order combined 2 or more of our services. Book now and let us your sofa today!